According to an article I read in Aviation Week a couple of years ago, the Max supercruise speed is M 1.82 and normal supercruise speed is M 1.5, both take place above 50000 ft. Given the current altitude restriction of 44000 ft, which hopefully will be lifted when the valve of the anti-G vest is replaced by the end of the year; Does anyone know how much, if any, effect the restriction might have on the plane's ability to supercruise? Please note that I'm not soliciting, nor am I expecting any classified info on this subject. Just looking to learn something out of meaningful discussion. aw2007 wrote: According to an article I read in Aviation Week a couple of years ago, the Max supercruise speed is M 1.82 and normal supercruise speed is M 1.5, both take place above 50000 ft. Given the current altitude restriction of 44000 ft, which hopefully will be lifted when the valve of the anti-G vest is replaced by the end of the year; Does anyone know how much, if any, effect the restriction might have on the plane's ability to supercruise? Please note that I'm not soliciting, nor am I expecting any classified info on this subject. Just looking to learn something out of meaningful discussion. Either that article was incorrect or you remember it wrong. The F-22 can supercruise at M1.82 and reach an altitude of over 50,000 ft, but not at the same time. Actually, best supercruise performance is supposedly at 35,000 ft.
Aviation Week (Feb 8/09) – F-22 Design Shows More Than Expected. Desired radar signature from certain critical angles is -40 dBsm., supercruise at Mach 1.78 rather than Mach 1.5, better acceleration, operation from about 65,000 feet using afterburner, 5% greater range from its APG-77 AESA radar. Yes, Fisk, that is the article I was referring to. Atle: Interesting. May I ask where you got your info from? You do realise that the quote contradicts your original statement? 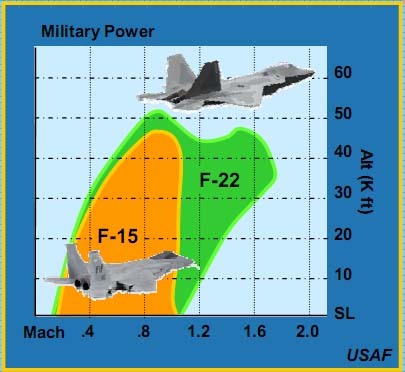 As for the original question, no, the altitude restrictions has not impaired the supercruise capability of the F-22. The F-22 can supercruise at a wide variety of altitudes, including at extreme high altitudes. The speed may change slightly, due to the effects of altitude on Mach numbers. Where'd you hear that? Smells like BS. There's at least one account out there of a pilot talking about supercruising at Mach 1.9 at 60,000ft+. Designing it for supercruising at 60,000ft would be totally pointless if it required AB to do it. As for that graph, the DoD almost always SEVERLY understates things in "official" documents. For example the Seawolf SSN is listed as max speed of 25 knots and max depth of 800 ft.
sferrin wrote: Where'd you hear that? Smells like BS. There's at least one account out there of a pilot talking about supercruising at Mach 1.9 at 60,000ft+. Designing it for supercruising at 60,000ft would be totally pointless if it required AB to do it. As for that graph, the DoD almost always SEVERLY understates things in "official" documents. For example the Seawolf SSN is listed as max speed of 25 knots and max depth of 800 ft. It comes from Major General Charles R Davis, USAF, at an official presentation. sferrin wrote: For example the Seawolf SSN is listed as max speed of 25 knots and max depth of 800 ft.
Haha, I love it whenever I read press reports that state submarines can dive to 800ft, it's like saying a Ferrari can reach 60mph. Atle wrote: It comes from Major General Charles R Davis, USAF, at an official presentation. That's a pretty vanilla presentation. You're not going to see an unclassified presentation, with the full flight envelope of the F-22. And that's just in first gear. What did I miss? The presentation was F-35 to a business group? Where was the F-22 data? Thanks, I guess the numbers quoted were just extracted from the graph?